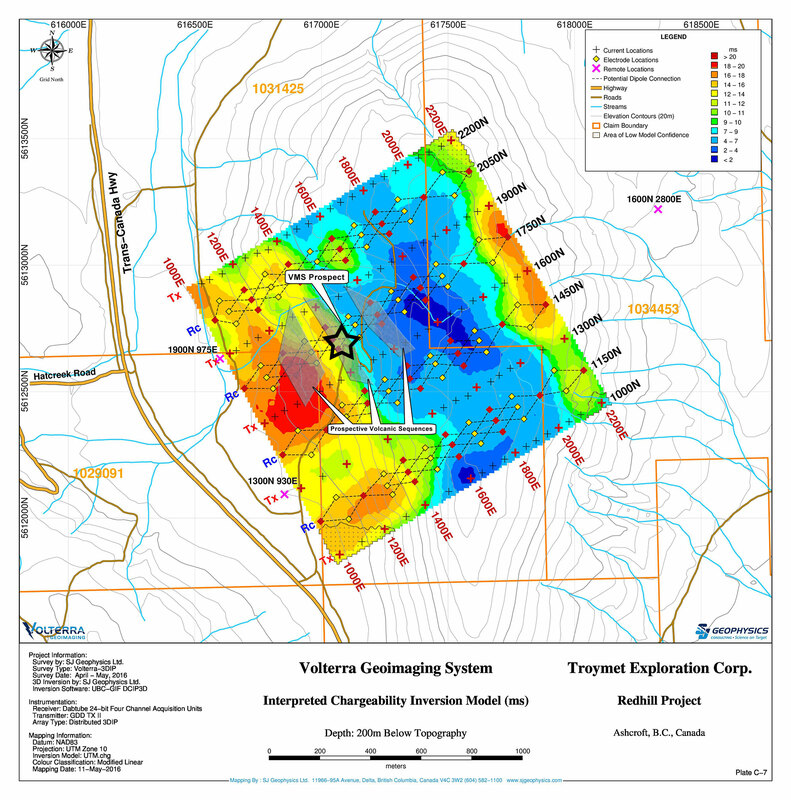 July 25, 2016 - Troymet Exploration Corp. (TSXV: TYE) (“Troymet” or the Company”) is pleased to report that the program of detailed follow-up soil sampling and prospecting of 3DIP anomalies on the Alpha zone and evaluation of the gold-, copper-and zinc-in-soil anomalies on the Alpha South zone is complete. New drill targets have been identified associated with slumped/mechanically transported sulphides and the area of volcanic stratigraphy prospective for the discovery of VMS deposits has been significantly expanded. The 3DIP survey mapped previously unrecognized and fundamental geologic patterns in the Alpha zone where the geologic sequence dips steeply west (~75°). The 3DIP shows where sulphides are introduced into the volcanic sequence accompanied by increased silicification, which is mapped by the resistivity. 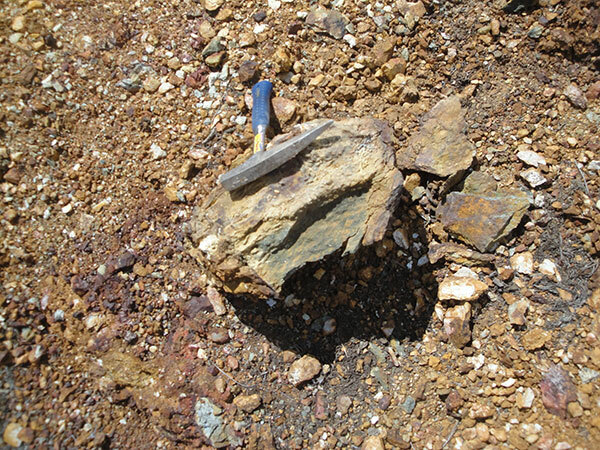 Plentiful breccia boulders, several of which contain massive sulphide blocks (photo links: angular sulphide in breccia; bedded sulphide in breccia) have been found in a prospective volcanic sequence (~100 m wide) that is coincident with the strong, chargeability/resistivity anomaly. The horizon is located ~70 m into the hanging wall of the VMS prospect (map link: chargeability showing prospective volcanic sequences). The sulphides are dominantly of pyrite with trace to minor chalcopyrite. The boulders represent slump features and/or mechanically transported mineralization likely the result of brecciation at source, transport down-slope by gravity-driven submarine debris flows, and deposition in depressions. What is geologically termed “transported ore” can form substantial bodies of mineralization as in the Buchans and Boundary VMS deposits in Newfoundland. “In the current program the best hole was R87-7 which intersected 1,236 ppm copper from 171 to 204metres along with 1,694 ppm zinc, 5.7 ppm molybdenum and 2.4 ppm silver. The remainder of the hole was not anomalous. The higher grade intersection was associated with a relatively high pyrite content of 5% compared with 2% for most of the hole. 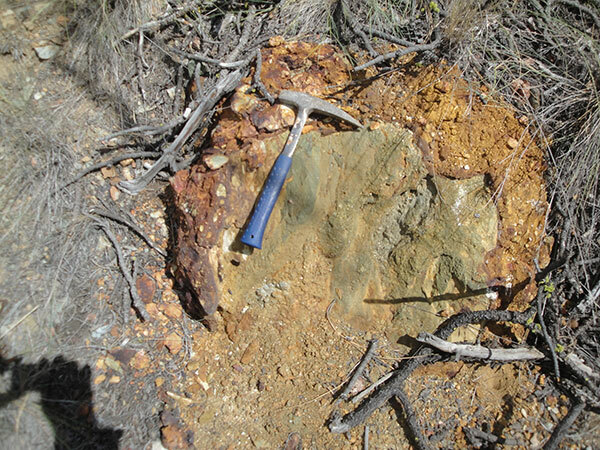 Here the host rock consisted of interbedded rhyolites and andesites with chorite-sericite-quartz-pyrite alteration with minor chalcopyrite mineralization. (1987 BC ARIS Report 17263).